Day 1 Bangkok/Chiang Mai: Morning departure from Bangkok for a one hour flight north to Chiang Mai, the “Rose of the North”, famous for its friendly people, beautiful women, refined handicrafts, cool climate and stunning mountain scenery. On arrival you will be met and transferred to your hotel. This afternoon enjoy an “Inherited Craftsmanship” tour to witness the process of making and weaving silk and cotton. 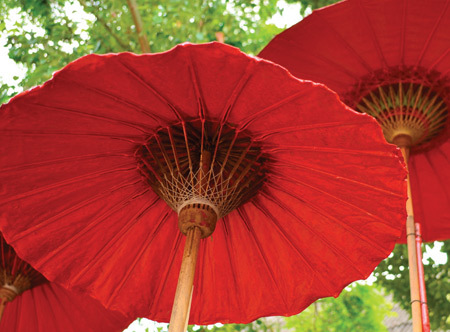 Proceed to Bor Sarng, the umbrella village where delicate Thai paper umbrellas are produced and hand painted. Finally observe the intricacies of lacquerware, silverware and teakwood furniture. Tour price: The price shown is based on the best value travel dates in low season and includes domestic flights as indicated, 3 nights accommodation, sightseeing as outlined and transfers. As an alternative to the full day tour on day 3, Elephants, rafting & hilltribes tour is available for an additional £9 per person.